During the production process of gear wheels, the tool seizes. Thus the motor current increases abruptly. In order to avoid damages on the tool, the work piece and the machine, the motor current shall be measured and the force with which the tool touches the work piece shall be established. 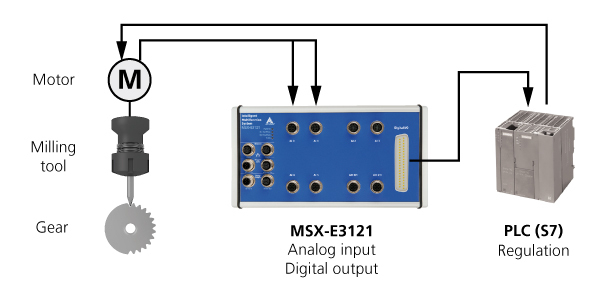 After the initialisation of the production process, the Ethernet multifunction system MSX-E3121 measures the tools motor current. As soon as a limit value is exceeded, the system triggers the PLC via digital output to shut down the motor.